As a small family run business, we are all pet owners! With a pack of Alaskan Malamutes, a trail running boarder collie mix, and a show-biz dalmatian, and a smattering of cats, we love pets! In everything we do, we believe in caring for our furry friends, emotionally and physically. We believe that the way we take care of our animals is a strong reflection of ourselves. We do this by creating eco-friendly products that protect our pets as well as the environment, and that make it easy for you to give your pets the proper care they need and deserve. Let's face it, pets love playing in the dirt. Digging, rolling, scratching, they do it all. While most pets are great about self grooming, sometimes you are in a hurry to get their precious paws nice and clean for the car ride or before they come inside. Park City Pet Wipes are the perfect solution to keeping your furry friend nice and clean! Whether its dirt and mud, or maybe an extra furry bottom that needs to be cleaned every once in a while, these pet wipe cloths are the solution. They can be used to help clean your pets Paws, Coat, Face, Ears, Skin & Teeth. Our wipes will help Detangle your Pets Hair and Deodorize unpleasant smells. All this is encased in an Eco-Box that Protects your Pet Wash Cloths from getting dried out, stale, squished or squeezed. OUR INGREDIENTS: aqua, glycerin, phenoxethanol, didecyldimonum chloride, alkyl dimethyl benzyl ammonium chloride, cocoamidopropyl betaine, organic aloe, barbadensis extract, lemon oil, organic chamomile flower extract, green tea, organic chamomile flower extract, tea tree extract. Ears, Paws, or Bum! Park City Pet Wipes are safe to use all over your furry friend. Hypoallergenic and Deodorizing: Park City Pet Wipes are scented only with natural extracts, you will never find perfume's or other artificial fragrances. Our Pet Cloths also do not contain any ingredients known to cause allergic reactions & irritation. CRUELTY FREE & VEGAN: Park City Pet Wipe standards are in line with PETA, Green America, and Leaping Bunny. We care about your well being, the environment and our furry loved ones. MONEY BACK GUARANTEE: If you changed your mind about our Pet Wash Cloths, send your unused/unopened Pet Wash Cloths back for a full refund. 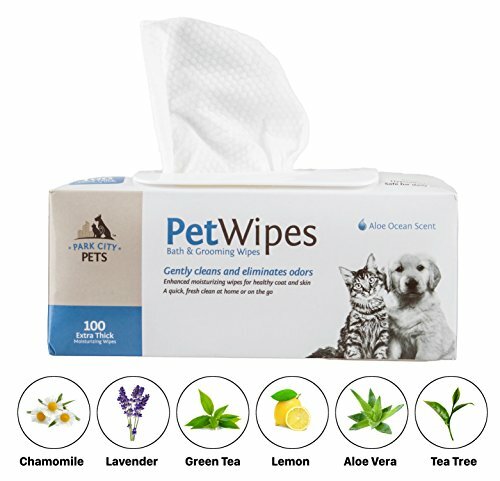 All Natural and Organic Extracts: Our pet wipes are infused with Natural & Organic Extracts such as organic aloe, lavender flower, chamomile flower and tea tree extracts. And they have a little lemon oil and green tea thrown in for good measure. This mixture gives a light sea breeze smell we like to call Aloe Ocean.Hypoallergenic and Deodorizing: Park City Pet Wipes are scented only with natural extracts, you will never find perfume's or other artificial fragrances. Our Pet Cloths also do not contain any ingredients known to cause allergic reactions & irritation. If you have any questions about this product by Park City Pet, contact us by completing and submitting the form below. If you are looking for a specif part number, please include it with your message.